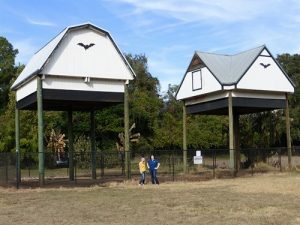 The first bat house was constructed in 1991 after then-Governor Bob Martinez complained of the odor while attending an event at Griffin Stadium which was home to about five-thousand Brazilian and Mexican free-tailed bats. Using bat excluders which allowed the bats to leave but not return, about three thousand of the colony was slowly captured and relocated to the new bat houses. After several years of management, the colony has adapted to their new home and grown tremendously to it’s current size. 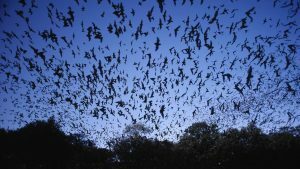 Evening skies at the University of Florida are filled with the site of hundreds of thousands of bats leaving the bat house and bat barn to start their evening hunt. They normally emerge about fifteen to twenty minutes after sunset on calm evenings with a temperature above 65° F. Spring through early summer gives viewer the longest viewing time as the bats emerge sooner after sunset and are active longer up until twilight. High winds, heavy rain or cold temperature will keep the bats inside so coordinate your travels accordingly. There are a few RV campgrounds a short drive from the University Bat Houses. High Springs Campground is located about 20 miles away in historic High Springs which is known for it’s antique and specialty stores. Travelers Campground is also a short drive away and is home to many exotic birds, goats, donkeys and horses which is fun for the kids. If you like to fish, try Lochloosa Harbor Fish Camp which is a “Old Florida” fish camp located on the 10th largest lake in the state. Golfers will enjoy the Grand Lake RV & Golf Resort which is part of the Sun RV Resorts chain. Music lovers will appreciate the Dixieland Music and RV Park which has outdoor musical events throughout the year.